Want to do something new and adventurous with your family? 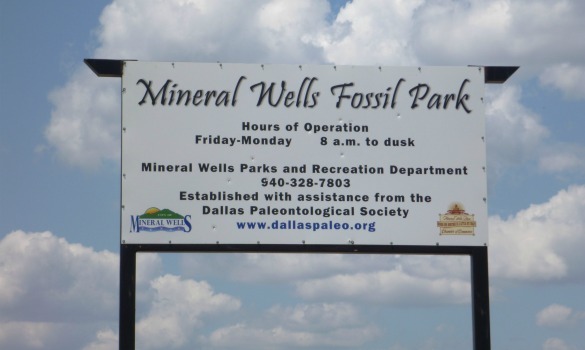 Visit Mineral Wells Fossil Park! A couple of years ago I heard that the Mineral Wells Fossil Park had opened. The land at the park is a landfill borrow pit that hasn’t been used since the early 1990s. However, over the years, erosion has exposed a bounty of fossils from the “Pennsylvanian period” in time. 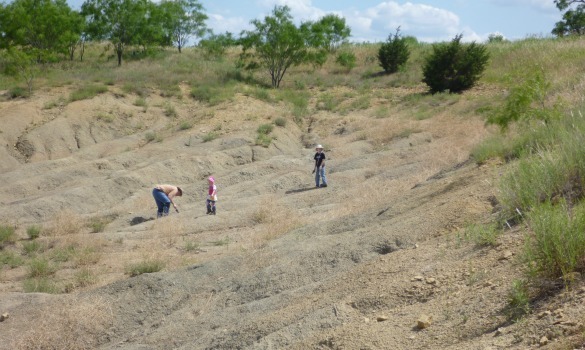 I had heard that the fossils at Mineral Wells Fossil Park were so abundant that even kids could easily find fossils there. We really don’t know much about fossil hunting. However, my family is intrigued by the idea of finding things that look like rocks but were actually alive long ago when this area was under water. So we decided to finally check it out. From the parking lot, follow the path down to the borrow pit. There is a handrail at the entrance to help guide you down the embankment but it really isn’t very steep. Once you make it down into the pit, just pick your spot and start hunting! I picked one area and worked on it for a while but my children moved around a lot, digging here then there until they had covered most of the area rather quickly. We all had wonderful success regardless of our “strategy”. The fossil collecting area is rather contained and you can easily see most of the area from any one spot in the pit. This made it easy for me to keep track of multiple children even when they wandered a short distance away from me to find their own special digging spot. 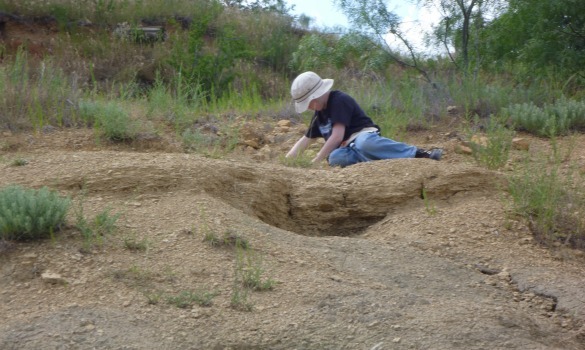 What types of fossil can you find at Mineral Wells Fossil Park? 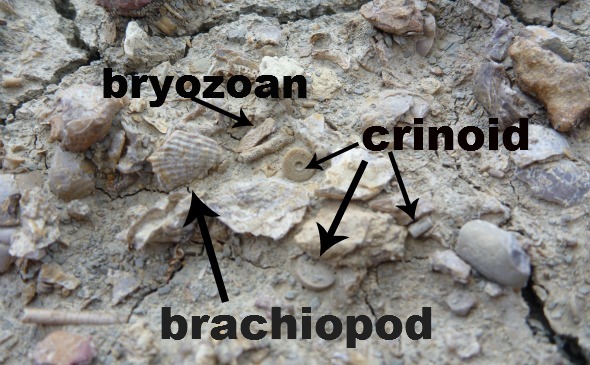 Crinoids, Gastropods, Brachiopods, Triobytes, Echinoids, and even Shark Teeth! Take a look at the Mineral Wells Fossil Park website to see pictures of the fossils you will find! There is also a giant sign with great pictures onsite to help you identify your fossils before you leave. We went 2 days after it rained. I was worried about it being muddy but the ground was completely dry. The rain had actually made it easier for us because it had washed away the top layer of dirt which left the fossils easily exposed on the surface. See for yourself. This is a picture of the undisturbed ground at my feet. It was literally covered with small fossils! The best part of finding fossils at Mineral Wells Fossil Park that you are actually allowed to keep what you find! You don’t need any special equipment at all but we picked up a few inexpensive items before our visit and they made the hunting experience a little more enjoyable for us all. 1. Hat and Sunscreen – There isn’t any shade here so you’ll want a hat and sunscreen to protect you from the sun. 2. Drinking Water – There isn’t any running water at the Fossil Park so you will want to bring your own to drink. Don’t let yourself get dehydrated. 3. Trowel – While you can easily pick up fossils without any tools, a small hand trowel is nice when you need to do a little digging to get a fossil unstuck. I found some very sturdy hard plastic trowels by Fiskars at WalMart for 97 cents each. Please note: hand trowels are allowed but larger shovels are not. 4. Apron – These are not necessary but we found it really helpful to have these small pockets on us to hold the treasures we found. I found these two pocket aprons at Home Depot for 77 cents each. 5. 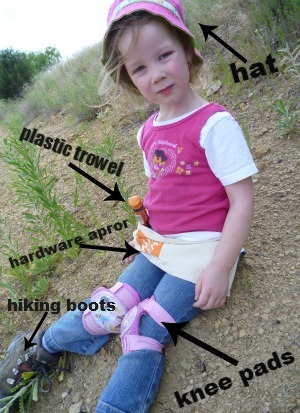 Knee Pads and/or a Towel – You’ll be down on the ground a lot picking up fossils so knee pads and/or a towel to sit on is really nice to have. The kids had their knee pads they use when they ride their bikes but the adults picked up some at a hardware store for a few bucks. 6. Hiking Boots – These are not necessary. However, some of the banks of the pit are rather steep and the larger traction on the bottom of hiking boots will give you some extra stability if you want to venture. 7. Water for Cleaning – We brought along a few squirt bottles with water in them to help rinse off fossils that we found so we could more easily identify them. We didn’t really need to use these much since the recent rain had washed away a lot of the dirt from them already. Want to learn even more about the park? Check out this story that Lone Star Adventures did on the Mineral Wells Fossil Park. For more information, please visit the Mineral Well Fossil Park webpage. 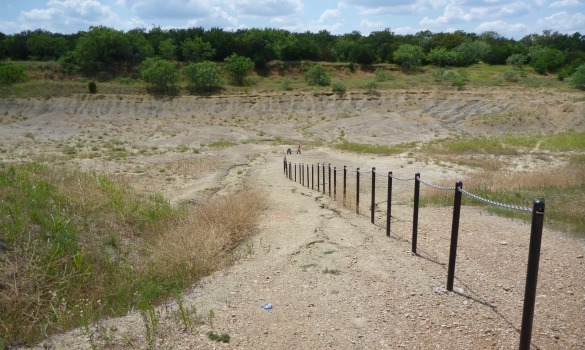 The Mineral Wells Fossil Park is located at 2375 Indian Creek Road, northwest of Mineral Wells. From Mineral Wells head west on Highway 180. Turn north on Indian Creek Road and drive appoximately 2 miles to the Mineral Wells Fossil Park entrance. The park is open from Friday - Monday 8:00 am - dusk. However, Lee Higginbotham posted the following on the Mineral Wells Fossil Park Facebook page - "The park was designed not to keep visitors out but for park management. If you visit the park during the a day that the parking lot gates are not open, feel free to park at the gates but not blocking them or blocking traffic. Lean under the gate and enjoy the park. You will not find a No Trespassing sign. Just pick up after yourself, as you would anyhow and give some fossils a good home!"